Both of these Kanbans have become invaluable tools to complement our 5S plan for creating a lean, organized workspace. The Kanban board is just one small step in the progress we are making in our Calhoun office. 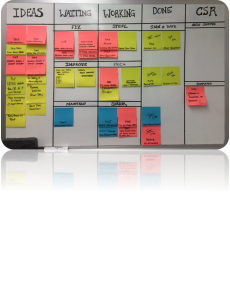 The Kanban board symbolizes the "standardize" pillar of the 5s system (Standardize, Sort, Shine, Set in Order, and Sustain) that we implement here at Calhoun to improve operations. Look out for a future TSP blog on the 5s system! We encourage every company to customize and implement the Kanban board in their own unique way. It has truly helped us improve productivity, stay on top of tasks, and not let anything fall off the radar for our customers.